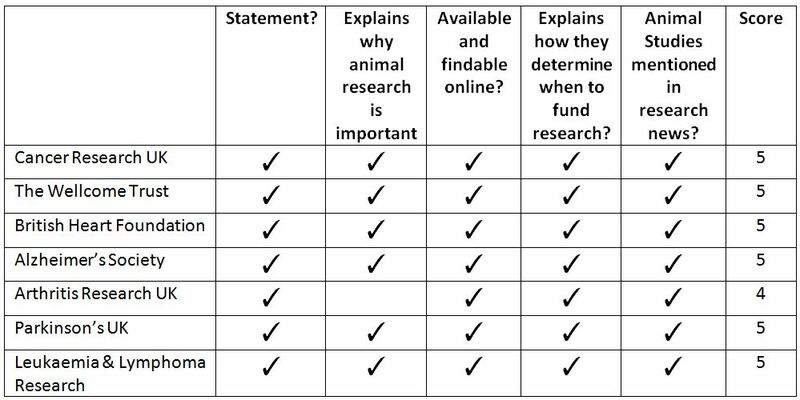 Following from our previous post on US charities explaining their animal research, we will now take a look at UK charities using the same criteria. Of the UK top 200 charities (by income in 2012), only seven conduct animal research. The ratings criteria are the same as that used to look at the US charities. To me, the most important thing is that information exists if people need it. Preferably people need to be able to find this information online rather than have to call up for it. Each of the following five criteria will give a charity one star. Thanks to decades of research, survival from cancer has doubled in the last 40 years, giving thousands of people more time with their loved ones. In fact, more than half of all patients will now survive for at least ten years. But this progress simply wouldn’t have been possible without animal research. At Cancer Research UK, research using animals is part of our efforts to beat cancer. This includes discovering the faulty genes and molecules that cause cancer, investigating how the disease grows and spreads, developing and testing new treatment and tests, and exploring how our immune system can help fight tumours. The 2,500+ word post, written by the Director of Science Funding, explains why animal research is important, its past contributions, and the reasons and conditions under which animal research projects may be funded. The main pity is that this blog post isn’t linked to from the policy statement, or better yet the information from the blog post put onto the policy statement page. CRUK also mention animals (usually mice) in research news stories, such as a recent piece that found the activity levels of particular genes in breast tumours could identify more aggressive forms of the disease. This story was mainly about clinical studies, but mentioned early findings in mice that led them there. The Wellcome Trust provides an easy-to-find, lengthy statement regarding why they both conduct and fund animal research. Here is a portion. and contraception for use by people and in controlling animal breeding. The Wellcome Trust is therefore convinced that the use of animals in research remains valid where the potential benefits to be gained by humans and other animals from such research outweighs the use of animals in that research. Wellcome news articles and other communications regularly mention the use of animals. For example their recent letter to the UK House of Lords regarding mitochondrial donation mentions the role of mice and monkeys in the development and testing of this new method. By studying new medicines and techniques in human cells in the lab first, and carefully trialling the best ones in animals, we’ve done all we can to make sure they’re going to be effective and safe for treating patients. The research community is constantly developing new techniques to help reduce the number of animals needed or non-animal models. Scientists we fund carry out as much of their research as possible on human volunteers, cells, or computer models for example. Similarly their news article and other pages on the website will frequently mention the use of animals like rats, mice and zebrafish. British Heart Foundation should also be congratulated for going front and centre with their animal research when they put out a TV advert mentioning their research on zebrafish. Drugs and new treatments that many of us take for granted, from antibiotics to blood transfusions and the current drug treatments for Alzheimer’s disease, would have been impossible to develop without research involving animals. Many people are concerned about the well-being of animals used in medical research. Alzheimer’s Society shares those concerns and strives to ensure that alternatives are used wherever possible. The statement is good, providing a positive explanation as to why animal research is necessary. It is also easy to find through the website or Google. The research news section of the website makes casual mentions of the different animals used, from fruit flies, to mice. Medical research using animals has made a vital contribution to advances in medicine and surgery which have brought major improvements to the health of people. Research using animals will continue to be essential to tackle many of the unsolved problems in understanding and treating musculoskeletal conditions. The whole statement covers regulation and the 3Rs, to explain when animal research can happen, but I’m not convinced they made the strongest case for why animal research is necessary. An example treatment made possible by animal studies would have really strengthened the statement. Arthritis Research UK regularly mention animal research in their news posts, such as a recent cell-based approach to regenerate bone and cartilage developed in mice. We believe there is an urgent need for ongoing research to advance our understanding of Parkinson’s, improve treatments and ultimately find a cure. We believe theuse of animals, such as fruit flies and fish, is currently an essential tool in this research, but we are committed to the minimum possible use of animals and to ensuring that highest regulatory standards are maintained. Since the 1970s, the lives of millions of people with Parkinson’s around the world has been transformed by the drug levodopa, This acts to partially replace the dopamine that is no longer produced in the brain due the eh death of nerve cells. Research involving animals has formed an essential step in the understanding of the effect of this vital drug. Leukaemia & Lymphoma Research have a strong statement and an FAQ on the issue of animal research. Both are easily googleable, and includes details of what animal species are used and what proportion of research projects involve animals (29%). Some of the biggest achievements in treating blood cancer that are now in routine clinical practice, such as stem cell transplantation, have only been made possible through the use of animals in research. The achievements of understanding blood cancer progression, understanding the basis for chemotherapy, and identifying the principles of bone marrow transplantation are just some of the revolutionary and lifesaving developments in blood cancer treatment that would not have been possible without using animals. Whilst there is a considerable amount of research that we support that does not require the use of animals, we believe that animal research is still necessary. Understanding how disease affects systems within the body, as well as possible treatments, requires investigation in whole body systems. Our animal research mostly uses mice, but we also use other animals like fruit flies and zebra fish. While the LLR website doesn’t put a lot of news in its research section, when it does it includes mention of the animals. A story about studying genes of patients with blood disorders mentions that cells from mice are also used to study how misfiring enzymes can lead to histone changes. When comparing the UK and US charities we see some stark differences. All the UK charities we looked at have a statement available on their website (and googleable). All make an effort to explain how and why animals are used in research. In contrast, most of the US charities do not have a statement available online, though many do mention the use of animals in news articles on the website. So what can the US charities learn from the British cousins? Well many US charities have prepared statements on the use of animals in research; they just need to get them online. If every charity which had a statement put them online they would raise the average score of American charities from 2.4 out of 5, to 3 out of 5. Many of the American charities could also work to improve their statements – there is good practice both sides of the Atlantic, and they could either take examples from other US charities like the American Cancer Society (see previous post) and Alzheimer’s Association, or they could look to their British equivalents. They are taking public donations, and the public have a right to know how this money is spent. If charities think funding animal research is important they should be able to explain why frankly and openly. Charities cannot hide their animal research – animal rights groups can find out even if it is not on their website. However, by putting information openly on their website the charity defends itself against activist attempts to “out” them. The public cannot be “shocked” by the “dirty little secret” that a charity funds animal studies if they have that fact stated openly and clearly on their website (with an explanation as to why). It is better for a charity to state it does animal research and explain the reasons why, than it is to let an activist or journalist put their own spin on it. Finally, we must foster an environment where both the public, and policy makers, understand the importance of animal research. The former demands the laws and regulations, and the latter put them in place. If the scientific community want to make sure their research environment is secure then they must encourage openness on the issue. Hopefully next time we conduct this analysis we will see even higher scores for charities across the world. Next Next post: Pioneering non-beating heart transplant success – thanks to animal research!